This is going to be a tough one to talk about. 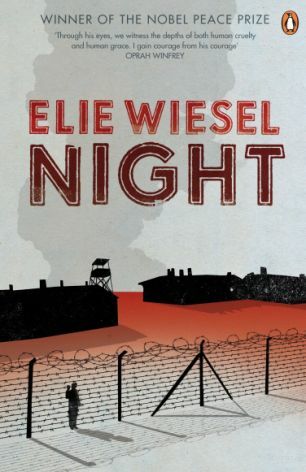 Trying to take a critical view of an autobiography always is, seeing as obviously there is no "plot" to speak of, just life events; that Night is an autobiographical account of life in the concentration camps of Nazi Germany, that becomes even harder. But I have a little while before life catches up on me again, so I'll give it a go. 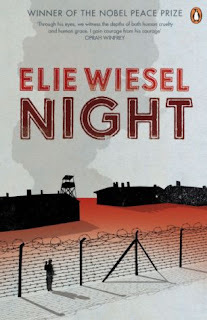 As I mentioned in the introduction there, this is author Elie Wiesel's account of his experiences in Nazi concentration camps as a teenager. It depicts the rounding up of the Jews in his small Romanian village, his separation from his mother and sisters and the gradual break-down of normal life and human dignity, until American soldiers liberated the camp. It's a sobering experience, and definitely an important text from a social aspect. I'm just not sure that it would really create the same effect as it would have done when people first started trying to deal with their collective history. Let me explain. I am not saying that the events depicted are not horrifying or deeply damning of human nature; the events still hold a lot of significance. I just think that the impact of them may well be diluted because, well, who doesn't know about the Holocaust? Who hasn't seen at least one film dealing with the Holocaust and its consequences? I just think that, in this day and age when the atrocities carried out against the Jews and many other groups that were considered "undesirable" are well-known and taught to children across the world, it can seem perhaps too familiar. It's an odd thing to argue: on the one hand, people need to know because the day we forget the deaths of over 6 million people is the day that we reach rock bottom as a species, but on the other hand, too much exposure and we risk getting bored by it, sad as it is to say that. I think that perhaps this book has lost some of its power because many of the images are familiar to us through film and literature. Another thing that I think goes against this book is that the Holocaust is not an experience that can be transferred to other people through mere words. Words are a seriously imperfect tool, and the Holocaust is one of those things that I don't think anyone who didn't experience it for themselves will ever understand, not anywhere near it. Please don't misunderstand, I don't mean these points to be criticism of the book itself; these are more points of criticism for the society that it will be reaching in years to come. In the next few decades, we will most likely lose the last of the survivors of the Second World War and the Holocaust; I honestly dread that day, because at that point, the only things that we will have will be records like this and the films that we have made to try and understand what happened. And admirable as they are, they will never be enough. Next review: Dawn by Elie Wiesel.